Wow! What can I say about the Canada Army Run? Firstly, this event is HUGE! They say it’s the fastest growing half marathon, and after being a part of it, I truly believe it. There are 13,000 5K runners and 12,000 half marathon runners. Both races took place on Sept 21, 2014. In it’s inaugural year (2008), the event started out with 7,000 participants. 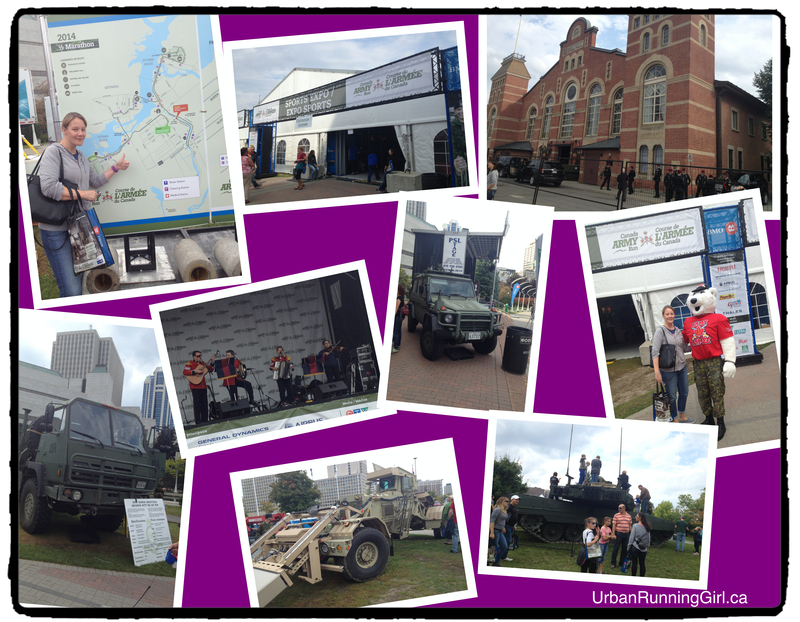 The Army Run benefits two charities. One called Soldier On and the other the Military Families Fund. I couldn’t say it any better than that. It was indeed all those things and more. The Race Expo is unlike most other running Expos. Yes, there are vendors selling running shoes, protein bars and various clothing items, however it was so much more. Home base was at Ottawa City Hall. This is where we went to pick up our race bib. Once we were given our bib, we entered outside of City Hall where there was a stage for entertainment, the sports expo tent, Baggage check (for race day) and Pasta tent/Recovery tent, which was to be used for the pasta party that evening. As well, all around this area were various military vehicles on display for people to get inside, climb on top of or people could speak with various military officers for more information. The vehicles were a big hit with the kids. The half marathon (mass) start began at 9:30 am. We arrived in the area with lots of time to make a bathroom break and casually walk towards our corral areas. I was well positioned back in one of the later corrals, so I couldn’t see everything that was going on, however, I did manage to see on the big screen the start for the injured, ill or disabled participants of the half. The crowd gave a lot of support as they started off on their race. The day was calling for rain, however, at the start, we were lucky for it to be dry. Soon after a few waves, my own corral was off. I started off a little fast, however, I soon found myself into a comfortable pace. 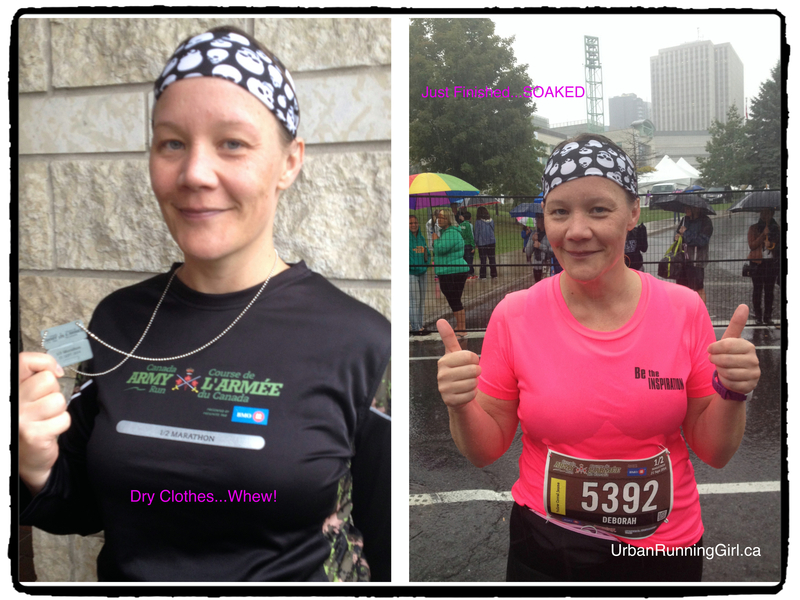 I was a little worried about this race, as my performance at the Biggest Loser Half just a few weeks prior was quite miserable in terms of time. I knew that Ottawa would be a bit of a challenge as there are many gradual hills all along the course, however, on this day, I seemed to be feeling pretty strong. 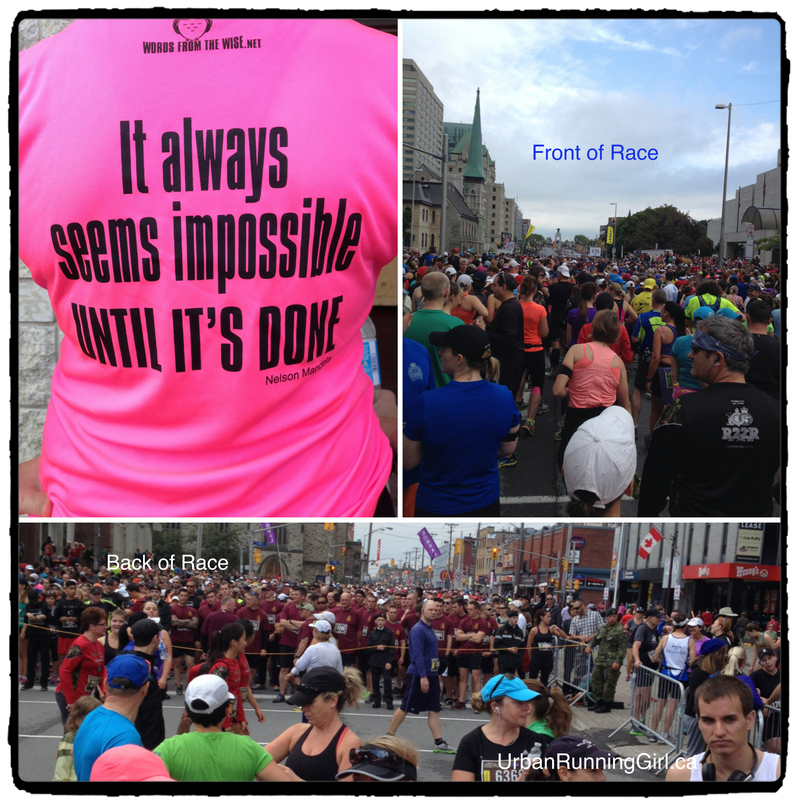 Ottawa is such an amazing city to run in. The views are fabulous; running through Parliament Hill, 24 Sussex, Rideau Hall, Canadian War Museum and other local landmarks; however, the city’s most fabulous, energy boosting sight is it’s spectators. I don’t think I ran more than a kilometre before I saw a spectator or cheering section, rooting for us. It was a fantastic show of support and I can’t say I’ve experienced any better spectator support in all the races I’ve run. Ottawa certainly sets the bar high. I was able to reach the 10K mark, and then the rain started. I didn’t mind it so much at this point as it was also a very humid day. The rain was quite refreshing. At least I thought so. It did however stop for a while which was nice. Shortly after I high-fived the Governor General and Commander-in-Chief of Canada (Oh Yes I did!) at Rideau Hall, the rain started again. 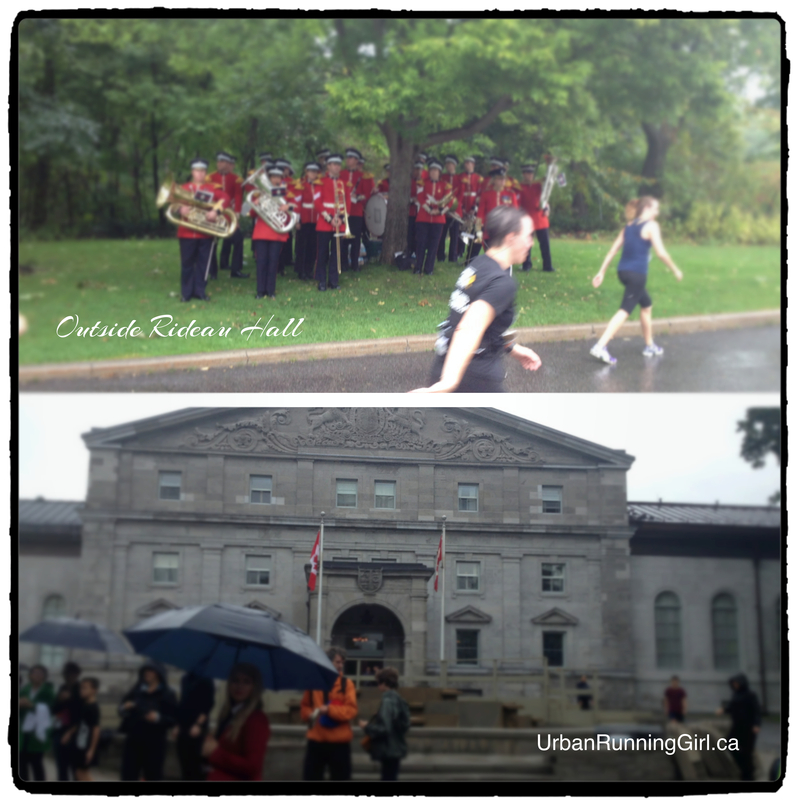 After I ran passed Rideau Hall, I got myself into a great running pace. Even though the rain was coming down, I was feeling great. In fact, I was feeling kinda warrior-like, fighting through the rain with each step. This was somewhere around the 9th mile. I really thought I was going to finish around 2:35 which I would have been very happy with, considering my lack of training. However, things took a turn for the worse at mile 11. I started having a very intense pain and cramping on my left back ankle. Achilles? Not really sure, however, each time I ran, the cramping got more and more intense. So much so, that my foot almost felt like cement with every step I took. I had to stop and stretch out my calf muscles. I did this at least 3 times from mile 11 to 12 and had to do some walking. After I passed mile 12, I started to run again, and was able to keep a slow pace without any cramping. The stopping set me back, however, I finished strong at the end at 2:39 chip time and it was still so much better than the BL half. Would I recommend this race to people? Absolutely! It is by far, my most favourite Canadian race. I hope to be back next year.